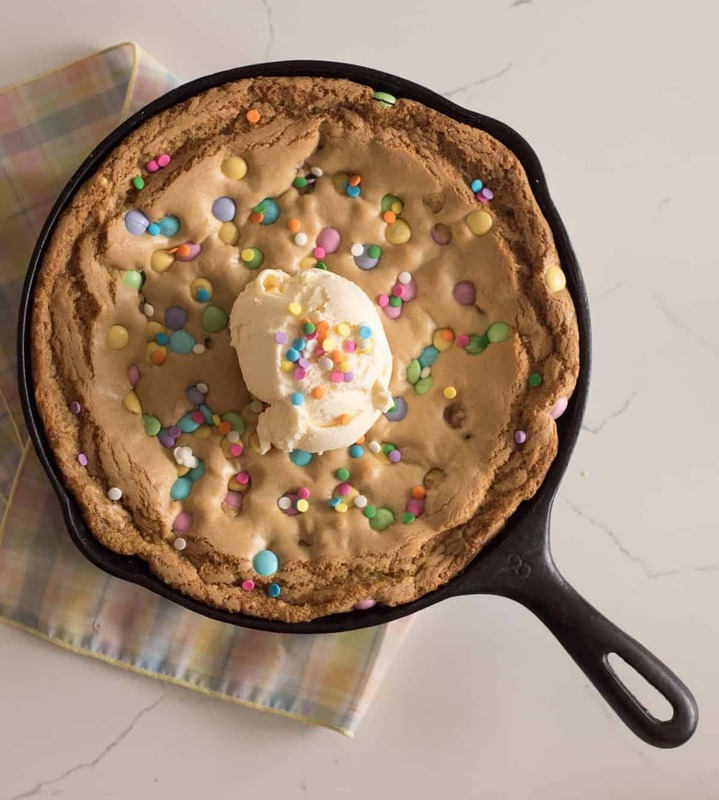 Warm and gooey skillet cookie recipe made with butter and brown sugar and topped with M&M’s – perfect with a scoop of ice cream. This is the first skillet cookie to hit the blog and I’m not sure why it’s taken me so long to get you a really simple skillet cookie recipe. I love these things! They are the easiest, most fun, casual but pretty dessert around. They are essentially a giant cookie that you make and bake all in the same skillet. The edges crisp up like a normal cookie but the middle stays soft and gooey, kind of like a chocolate lava cake. 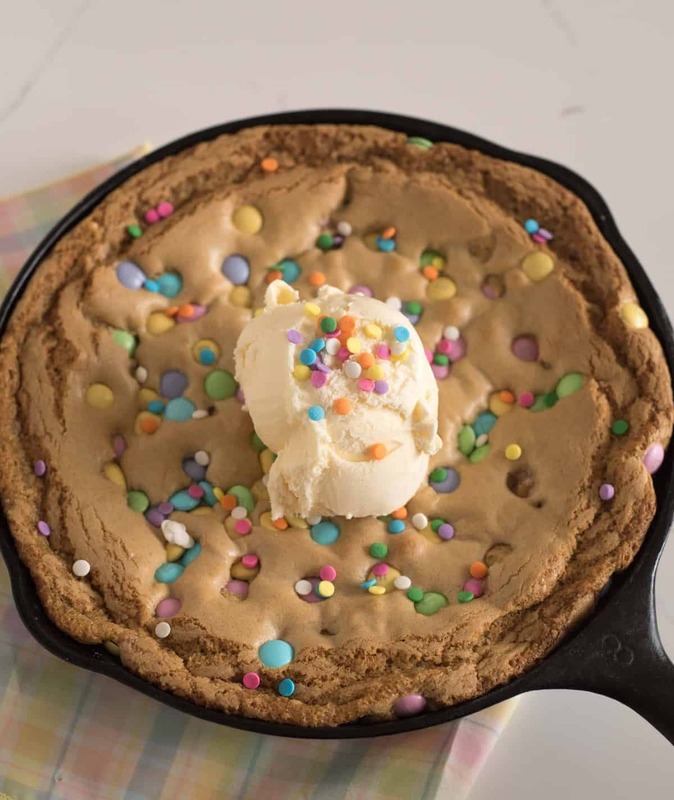 The best part is adding a scoop of ice cream to the top of the skillet cookie after it comes out of the oven and letting it get soft on the hot cookie. I like this dessert because it’s casual. I just scoop the ice cream in a pile in the middle of the cookie and pass out spoons and we all dig in. This is a great recipe for a night in with the family or a girls night. If you aren’t into sharing a dessert, you can dish the skillet cookie up into individual bowls. It’s a bit messy, but it still tastes great. I love using M&M’s when it comes to fun desserts because they are so bright and colorful and it’s pretty fun to use seasonally colored candies at the appropriate time of year. Who doesn’t love bright festive M&M’s in their cookies?! 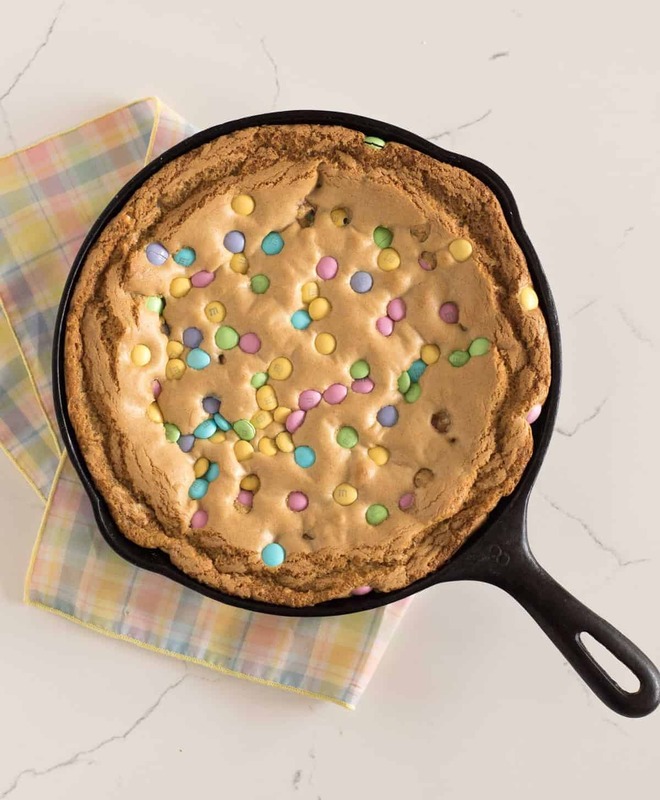 Cast Iron Skillet Cookie Recipe – Tips and Tricks for Success! You are definitely going to want to know what size skillet you are going to use. It affects the cooking time quite a bit. 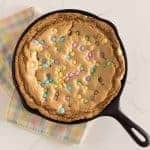 And if you don’t have a cast iron skillet, any oven-safe skillet will work; just make sure it’s about 2 inches deep so that your cookie doesn’t cook out over the edge. (The recipe tells you cooking time differences depending on skillet size, just check out the notes). Do I have to use M&M candies? Of course not! Feel free to use chocolate chips, chopped candy bars, or just about anything else you like instead. It’s important that you let the butter and sugars cool for the 5 minutes before adding the eggs so that you don’t make scrambled eggs by putting the egg in while the butter is still too hot. Here’s my favorite 12 inch cast iron skillet from Lodge. You can’t beat it for $30 (and it’s made in the USA). In a 10 or 12 inch cast iron skillet, melt butter over medium heat stirring often, until it starts to bubble and is completely melted. Turn heat to low and add sugar and brown sugar, stirring well, until the mixture is well combined. Remove from the heat and let the mixture cool for 5 minutes. Add 1 cup of the M&M’s candies and stir to combine. Smooth the top of the cookie in the pan. 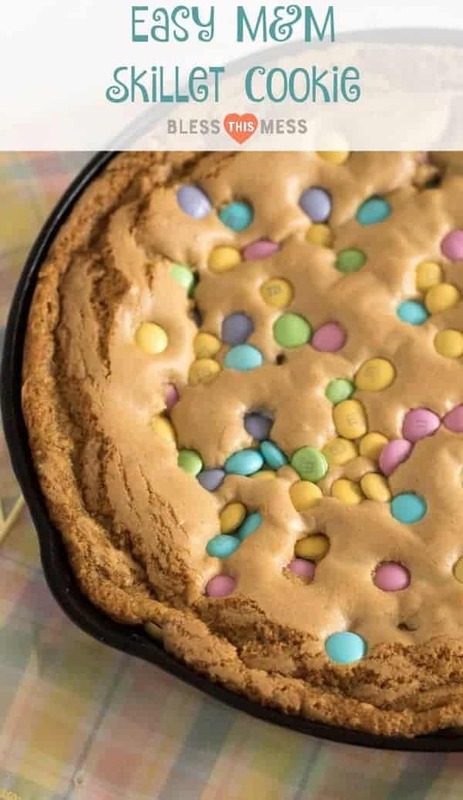 Drop the rest of the M&M’s on top of the cookie so that they just rest on the top and look pretty. Bake at 325 degrees for 25 to 35 minutes or until the edges are golden brown. The center of the skillet cookie will have a crust but will still be gooey underneath; the edges will be crisp. The smaller pan will cook for more time and a larger skillet will cook for less time. Top with vanilla ice cream and eat while still warm. 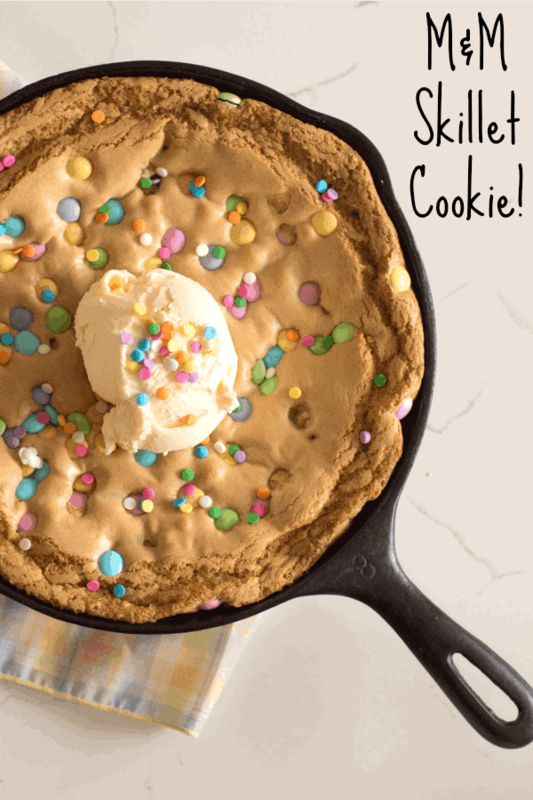 I think what makes this the best skillet cookie recipe is that it is super simple to make. 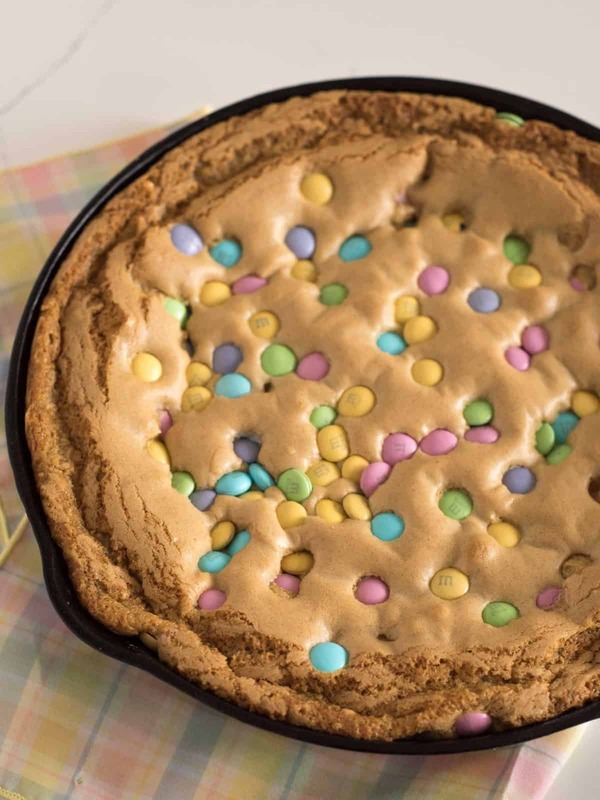 You make and bake the cookie in one pan – how nice is that? I can’t wait for you to make one of my all-time favorite desserts soon! Tell me how it goes and eat a scoop for me! So many great cookie recipes to choose from. Enjoy!